On this Memorial Day we spent time with family. We had a nice traditional Memorial Day dinner. Nothing fancy, just grilled hot dogs, and all the fixings. It would have been better if our son Harold and his wife were here to celebrate with us. They are stationed at Goodfellow AFB in Texas. I am grateful though that we are able to talk with him on the phone or by email. Many families will never be able to spend time with their sons or daughters, mother, father or spouse, because they gave their lives for our freedom. To them we say a heartfelt THANK YOU for their sacrifice and to all who have served. Our family has had many members who have served our country. My father in WWII, Sonny’s father in Vietnam as well as my oldest brother, Sonny during the Gulf War, our son Harold and three nephews in the Iraq and Afghanistan war. It is not a thing we want them to do but we are proud of their bravery and outstanding service. God Bless them and the U.S.A.
Ronald stopped by this afternoon with his green note pad in his hand to take an inventory of the leftover building material from the porch project. There were some extra lumber pieces that can be used on the chicken coop and woodshed. After making his list he told me to dig out my checkbook because I will need it tomorrow. I have been ordered to meet him at 8:00 sharp in the morning for a material run. Actually it will be numerous runs. Hope my checkbook holds out. The tempature today was in the low 90’s. Thank goodness it isn’t too humid and staying in the shade is pretty comfortable. We don’t have air conditioning, but good insulation and ceiling fans seem to keep the house fairly cool. The sun may be hot, but it charges the solar system and batteries, which provides the electricity to keep the ceiling fans moving. 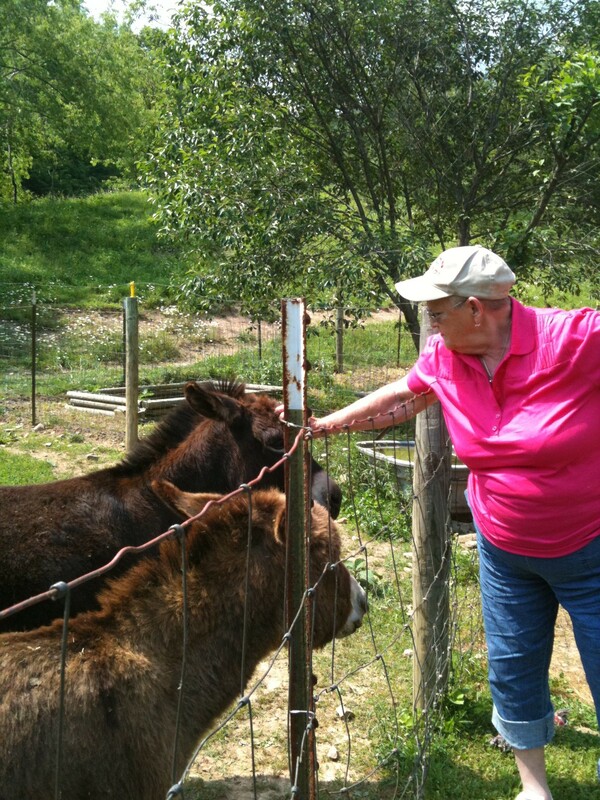 As I sit here on the porch in late afternoon there is a cool breeze calmly blowing in from the back pasture. Most of the porch is in shade now and the temperature feels comfortable. It is one of the things I love about living out here. There is usually a nice breeze and as the evening comes in the temperature cools down. Most days we are at least five degrees cooler than in town. Not so good in winter, but nice for summer. Sonny and I decided to take a day off from yard and garden work and just enjoy the afternoon. We took his folks who are here visiting for the holiday weekend, for a little ride and showed them the town of Salem. We told them not to blink. Of course we had to stop by the Dairy Queen for a ice cream cone. I think there is an ordinence that states that if the temperature is above 75 degrees and a Dairy Queen is within 50 feet you must stop in to have an icy treat to cool you down. I certaintly don’t have a problem with that and my figure is a testamony to it. curious and had to see who came to visit, or better yet, see if anyone brought gifts of apple or carrots. My father-in–law now wants one or maybe two. Last night before I went to bed I programmed my inner alarm clock to wake me up at 6:00 this morning and it went off right on time. I quietly crept around the house in bare feet and tried not to disturb the snoring slumbers of my husband and in-laws. Like a stealthy ninja I prepared the two Corningware coffee percolators and placed them on the lit burners of the gas stove. I hastily dressed in my gardening garb and slipped out of the door. No one was the wiser. The only evidence of my presence was the bubbling brew and the heavenly aroma emanating from the direction of the kitchen stove. I walked out of the mudroom door and stepped into the new day. The ethereal morning mist still hung between heaven and earth. Although the sky was light, the sun had not risen above the mountain ridge. The birds were in morning song and I could hear the hollow echoes of a Pileated Woodpecker hard at work in the distance. 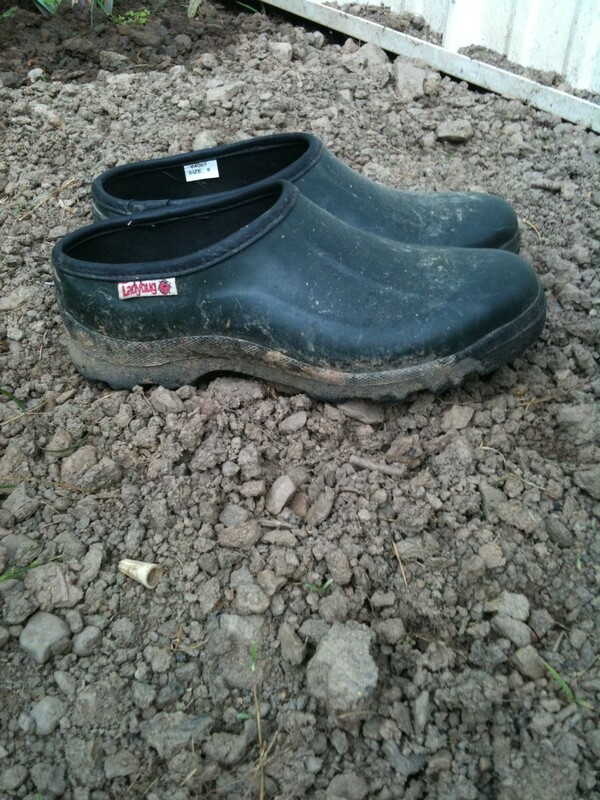 My feet stayed dry in my rubber garden clogs as I walked through the wet grass toward the garden. The metal garden gate loudly scraped across a stone as I swung it open and I hoped the noise didn’t find its way through the open windows of the house. I didn’t hear any muttering so I figured I was safe. The plants stood at attention as I strolled up and down the rows for inspection. Two sweet potato plants and a Roma tomato plant were the only casualties. The string beans we had planted last week were breaking through the ground. I needed to move on, the pumpkin patch was not going to dig itself. I dug my spade fork into the bare patch of ground in the right corner of the garden. It should be the perfect spot to plant the Green Stripped Cushaw pumpkin seeds that Vickie ordered for me from R. H. Shumway’s. She says these pumpkins make a creamier pie than a regular pumpkin and are less stringy. Sounds like my kind of pie. The earth turned easily and I only hit a few stones and chunks of wood. 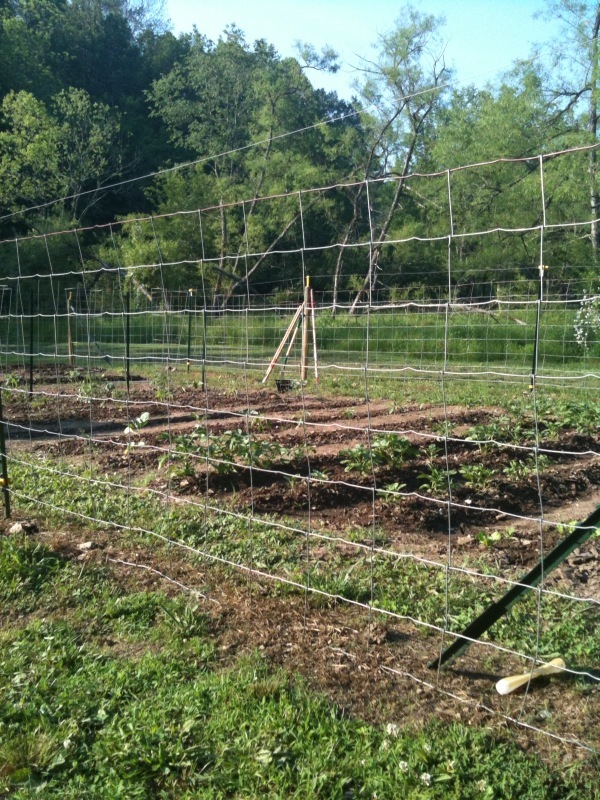 As I started to mound up the rows with my hoe I see Sonny saunter out towards me carrying his red coffee cup. I guess the aroma of freshly brewed coffee had titillated his nostrils and sweetly awakened him. He helped me finish up the rows and we planted the seeds nice and snug. Hopefully this fall we will have a nice crop of pumpkins to make pies and to can for future use. It would have been nice though if Sonny had shared at least one sip of his coffee. All right, where to start. This morning I got up with a glimmer of hope in my eye. Verizon promised me that today will be the day I would have my phone installed. I was skipping around the house kicking my heals every once in a while with the anticipation of knowing I may be able to use the phone. I may even call a wrong number just to say that I could. At around 11:30 I started to wonder if something was up, no sign of anyone. Linda and I had to run into town to pick up an additional water barrel but my parents were here to keep everything in check when we were out. As we drove out we kept our eyes open for a maintenance truck but saw nothing. We then lost the hope we had. About 8 miles up the road we noticed 3 Verizon trucks at a “relay” box and I pulled over to ask if they happened to have any plans to come up my way. After they finished looking at me like I was a Martian and chuckling they waisted no time telling me they didn’t have any tickets for my work. I will call again in Tuesday morning. Now as if the telephone torture was not enough, I have been fighting another battle trying to get trash pickup at our place. Although it has not been near as challenging as the telephone it has not been wothout it’s problems. To cut to the chase on the story, we were told by the post office that we “had” to put our mailbox a half mile back up the road (this entire mailbox issue is a blog on it’s own). As we were heading out to pickup our supplies today when we went by our mailbox there sat our newly delivered trash can, a full ½ mile from my house. So back on track heading the 6 or so dirt road miles to hit the 2 lane asphalt we started seeing more and more dust (typically meaning we were catching a car in front of us). As the dust thickened, we noticed it was the Trash Truck. We started whooping and hollering and I mashed the gas to catch up. Flashing my lights and honking the horn I finally got the drivers attention and he pulled over. After some explaination it looks like next week they will actually pick up my trash from our house. All I can do is hope… again. For the last several months I have had the most frustration of any period of my life. I don’t think I have had more torment then this during my entire 22 yrs of active duty while in the U.S. Navy. Your probably wondering what could it be? Heart Attack or is Sonny working with NASA to engineer the space race to the moon? No nothing that simple… It is Verizon. The ridiculous amount of time that I have spent on the phone trying to get service to my house have been Herculean. Three months ago I called Verizon to start the process getting a telephone for our house. We are so far back in the boonies we have to drive over 12 miles just to get to an area that has a cell phone signal and we are over a mile past the last house on the road that has electricity. Anyway, I was asked about internet packages having cable, phone and internet (I just chuckled under my breath), I explained to the person that I live in a very rural area and that there is no chance that service is out there. They checked and backed away from that line of questioning. After asking for my address they suddenly realized they could not find my address. I gave them the Lat/Long and they thought I was talking French or something. Then I though it was best to give them turn-by-turn directions to my house. They told me they would submit my request to their engineers and to call back in a month. I was generous and called them back in a month and ten days. To my surprise they had absolutely no record of my call and nothing could be done without me submitting everything again. It was sort of like “Motor Vehicle” department when getting your car registered. “Do what we ask or too dam bad”. So here we go again. I gave them all the information, explained my off-grid situation etc. To my surprise they said they would be out on Wednesday between 8-5pm. I explained that there is no phone box around there and only the remnant of a “Green” phone box in a field over an 1/8th mile away in a field where many years ago there may have been a house. It was my thoughts that they would have to bury cables and go over a stream etc to get to my place. The desk jockey at Verizon really had no idea. On Wednesday I expected to see their truck pull up and watch the installers begin their tap dance about how they couldn’t… blah blah blah. Not a chance, they just didn’t show up. So the next day I called back. Got a new fresh face on the phone and started my 10 minute dissertation about my situation and asked what was going on with my install. I got some story about a error code that they couldn’t figure out what it meant and they would have to call me back. Two days later I called them back, got some other fresh face on the phone and had to explain everything again. They finally found that same pesky error code and guess what? They had to put me on hold to call someone to figure out what the code meant. After 5 or 6 times of coming online thanking me for holding I suddenly got a “Dial-Tone” Can you believe it, I was about to lose my mind. So I called right back and got another new fresh face on the phone and started my 15 minute dissertation once again about my situation and that I had had enough of being handed off to the football team only to get a disconnect. Finally they seemed to get that darn error code figured out and set me up for the install on the next Thursday, yep your right it was between 8-5 pm. Thinking I’m going to out smart them this time, I called Verizon promptly at 8:00 am to ensure the install was still on schedule. Yep, it all was 5×5. That is until 5:30 pm when I called them. Yep, got a new fresh face and started asking what was going on. And some dam error code was showing a problem. Of course they had no idea what the code meant and put me on hold. Like magic it was disconnected. I think you have already figured out that I called right back to another “freshling” and went at it once again. They finally told me they would have to call me back after they figured out what the code meant. Although I was losing my mind, I made sure they got my work number and my cell number even though I would have to drive back into town to check for messages. By now you may not be surprised that there were no messages from Verizon. I would be happy with Indian Smoke signals if we didn’t have a burn ban in the county. So I pumped my chest up this morning and got ready for battle. Yep, new fresh face was quickly turned into raw meat. I wasn’t a Chief in the Navy for nothing. In short asked for their supervisor and again to the Official Complaint Department. I now have a designated person along with their direct phone number for all further conversations. I have swallowed the hook again. They will be there between 8-5 pm this Friday. I made sure I told them I will believe it when I see it. Seven-thirty this morning Ronald’s green truck rumbled up my drive (bad lifter and all). He brought along his wife Vicki and Blair who is their helper for the day. Today they are going to extend our porch deck out an extra ten feet. Although I like our little porch the way it is, it will be nice to be able to entertain guests and not have them get up and move every time we need to open the door to go into the mud room. Before Ronald and his crew could unload his tools the delivery truck carrying the supplies arrived. Now Sonny and I could have attempted to build this deck ourselves but I can’t measure worth a darn and Sonny is accident prone. I can imagine what our porch would look like now. Lopsided and bloody come to mind. Thank goodness we have Ronald and Vicki. They made short work of the process. Ronald and Blair removed the front railing of the porch being careful to salvage the spindles and other parts that can be reused. No sense in wasting the wood. Then they used the post hole digger and dug three holes for the support posts. Luckily they didn’t hit any boulders. The edges of Ronald’s post hole digger are all bent from previous battles with rocks. It kind of resembles a medieval weapon that has seen way too much action. Next they put up the side supports and joists. Vicki was the “go for”, and she steadily carried boards, refilled the nail gun, and did any other task that needed to be done. You know, the usual stuff we go fors do. She had a job on her hands trying to hammer out the old nails from the reusable wood so I gave her a hand. 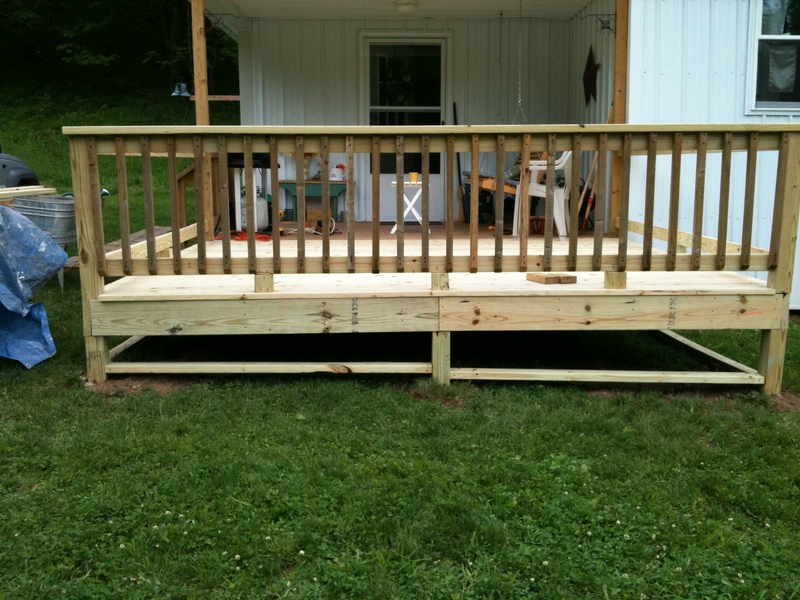 Before long the deck portion was finished and the side rails raised. They were able to put the spindles on the far end before they packed up for the day. The vinyl lattice that will go around the bottom did not make it on todays shipment. If it had I am sure they would have finished up the job. It should be here tomorrow and Ronald and Blair can finish up. My job today was to keep Sonny informed of the progress while he was at work. I took pictures with my Iphone of each step and emailed them to him. All in all I am pleased with the results and I know Sonny and I will enjoy many hours watching the real nature channel that is right outside our door. This morning I planted a row of zuchinis and one squash plant. I gave the garden a good soak down. Even though we had some rain yesterday the newly planted sprouts looked thirsty. So I obliged them. The sun has been shining nice today and when the sun shines it means laundry must be done.When you live off grid you can’t waste sun power. I’m feeling a little sluggish and wimpy today and the porch swing kept beakoning to me to sit a spell everytime I passed by it. So I did. 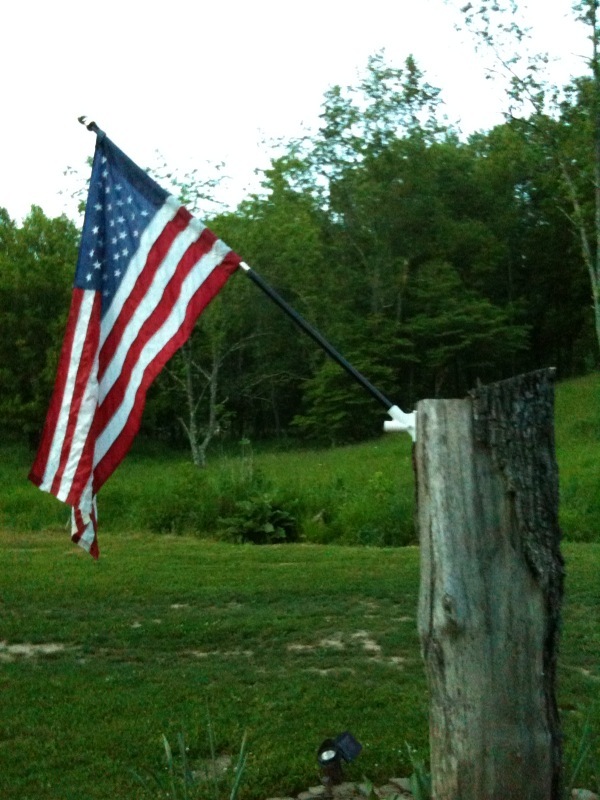 A soft breeze blew across the freshly laundered sheets hanging on my country clothesline. I watched as they swayed back and forth making little snapping sounds as the breeze blew stronger and whipped at them. I was hot and sweaty from hoeing weeds in the garden and the breeze dried and cooled my skin the same way it dried the sheets. 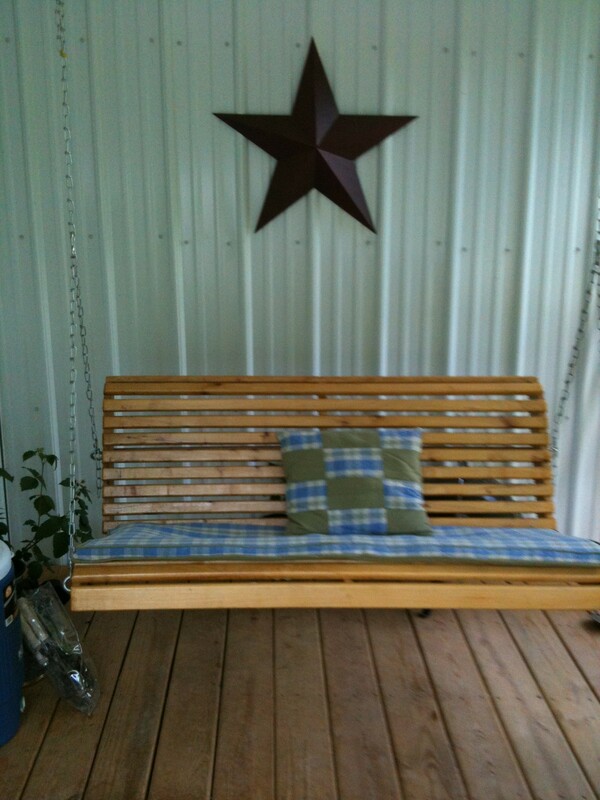 My eyes were getting heavy and I thought how great it would be if I could just stretch out here on this swing. The swing is about 4 foot long and I’m 5 foot 3, so I couldn’t really stretch all the way out. No matter, I just curled up and put the little pillow under my head. Between the breeze and the lullaby of the bees and birds I was headed to Snoozeville. Sonny said I looked like a cat curled up in a box. Now I know why they do it. All you need is a little cat nap and a good stretch to revive you. I’ve said it before and I’ll say it again, there is nothing like country livin’. 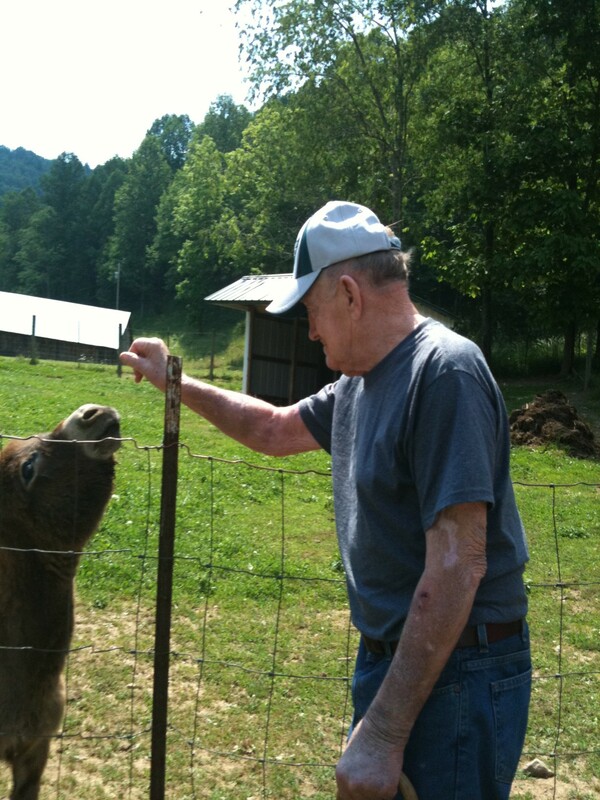 You are currently browsing the Off-Grid in West Virginia blog archives for May, 2010.